ABCorp’s Secure Issuance solution, delivered through our Custom Card System division, you can offer high quality and secure cards on the spot as a standalone service, or in conjunction with centrally based issuance. Founded in 1960, Custom Card Systems was an innovator in providing fast turnaround of small quantities of high quality cards. As demand for this sort of solution grew, CCS expanded into the financial business, integrating card technology with other vendors to offer an end-to-end solution for secure instant issuance of debit, credit and pre-paid cards. 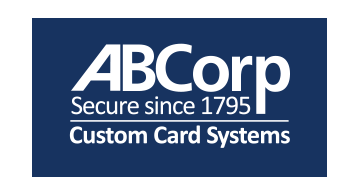 Custom Card Systems was acquired by ABCorp in 2013. In using the industry leading Evolve Instant Issuances platform we leverage its open architecture so that we can integrate with virtually any core and EFT processor. A selection of software options and hardware modules allows you to put together an instant issuance platform that will meet your needs today and in the future. Our instant issuance systems are easy to set up and use, even by new operators, and offer unparalleled quality and reliability.